Finally market has woken up and people can clearly see how rare these coins are and should be part of collections for all those collecting SA Coins as these coins were the first coins for SA. It is lovely to see historical interest starting to drive prices - that is the essence and foundation of our hobby. Not JUST investment! Just to refresh your memory, you bought an XF detail NCS 1802 full Shipsgulden from me for R1100 on 24th November 2009 and not R6000 as you said above. The BoB ID for that transaction was 16920467. Herewith the pic I took of the coin. I dont want the market to be under the wrong impression. 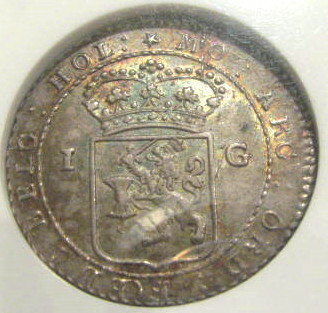 Here are pics of a full Gulden that graded MS62 from my collection. I paid R5,200 for it on 25/05/2008 raw and had it graded. 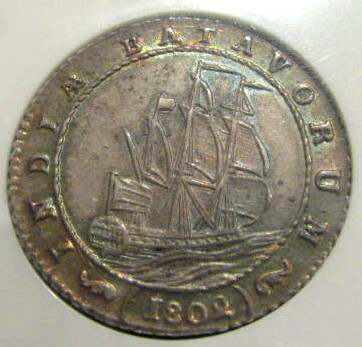 It sure is a stunning coin and marks the end of Dutch influence at the Cape after the Battle of Trafalgar (1803) where the French and Dutch forces were defeated at sea by Admiral Nelson for the British. The threemasted Dutch East Indiaman underway in full sale is particularly appealing visually. The evidence is mainly for the circulation of the fractions of Guldens by Major General Baird for the British after 1806 to alleviate currency shortage at the Cape (Engelbrecht pg26, 28). The full Gulden had little circulation to any large extent at the Cape. The standard copy of Krause for 1801-1900 does not show these scheepjesguldens and their fractions, but the CD version (6th edition) does. 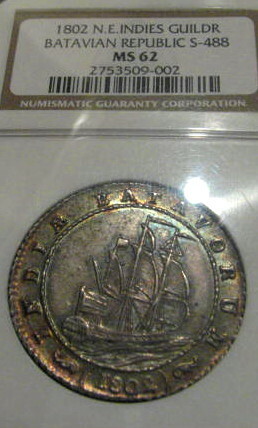 The really high value Shipsguldens are the ones that were struck in Gold and even Proof . I have seen one or two occasionally for sale on Heritage Auctions as full Guldens. Fractions of the guldens in Gold were struck but I have never seen any on offer. You are right and I could not find my paperwork.. .. have corrected my post. PS that is a beautiful coin.. in your post above.